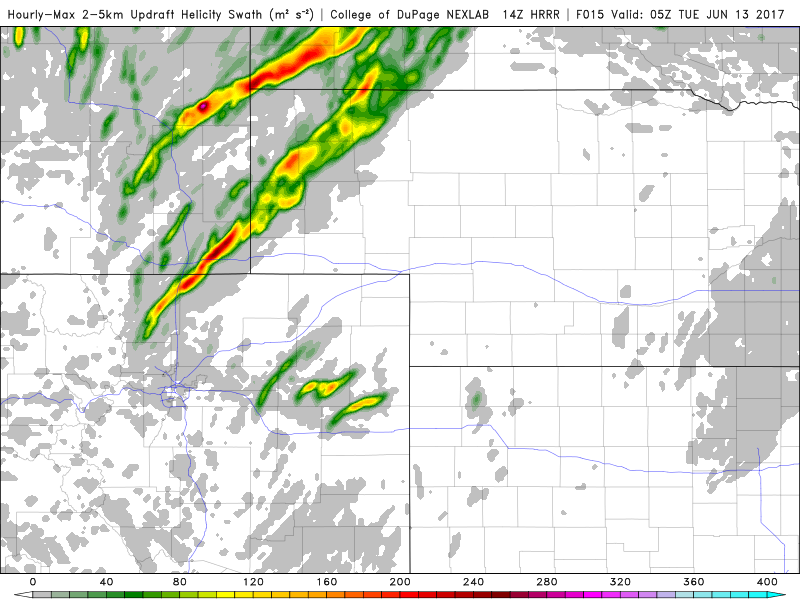 The 6z SPC outlook outlined a 10% tornado risk in southeastern Wyoming and the western Nebraska Panhandle. The 13z update enhanced this to a 15% hatch risk. I had spent the previous day visiting Mount Rushmore and the Black Hills on a down day and spent the night in Wheatland, WY expecting to wake up in the target area. 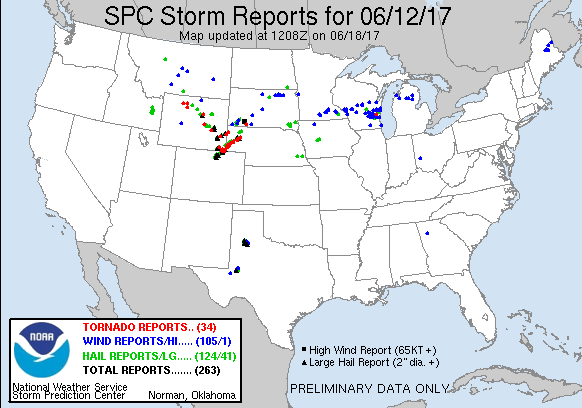 One of the main concerns for the northern target was the lack of roads once you get towards the northwestern Nebraska Panhandle. It is literally devoid of even sketchy roads for a large swath of the Panhandle, especially in Sioux County. 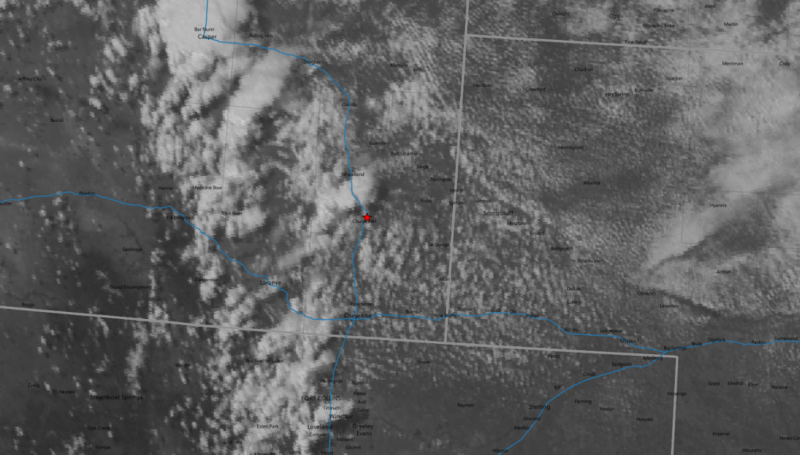 We noted upper 50s dewpoints were already in place in southeastern Wyoming at 11am and mid to upper 60s across Western Nebraska with Ogallala reporting in at 67°! Moisture was definitely in place and not going to be an issue. The first mesoscale discussion of the day was issued at 1729z, very early in the day indicating a tornado watch was likely in the next couple of hours. 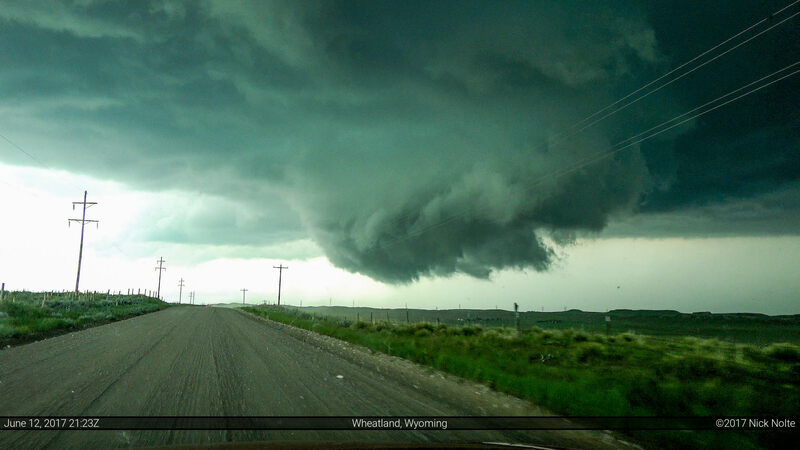 We hung around Wheatland until about 18z when we began to head south on Interstate 25 towards Chugwater. We exited there and found a nice place west of town to watch the skies as cumulus began to percolate. The tornado watch was issued just after 19z and it was a PDS watch (particularly dangerous situation) with probability of strong tornadoes at 80%. 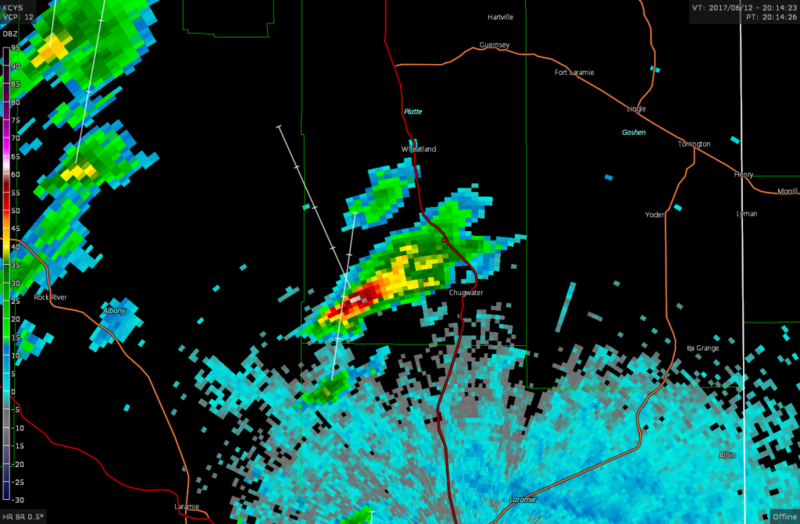 Around 20z a cell fired just west of us and we began north on I-25 to get ahead of it as it was moving north north-west. We drove up to Slater and got off the interstate to watch as the storm continued to develop. 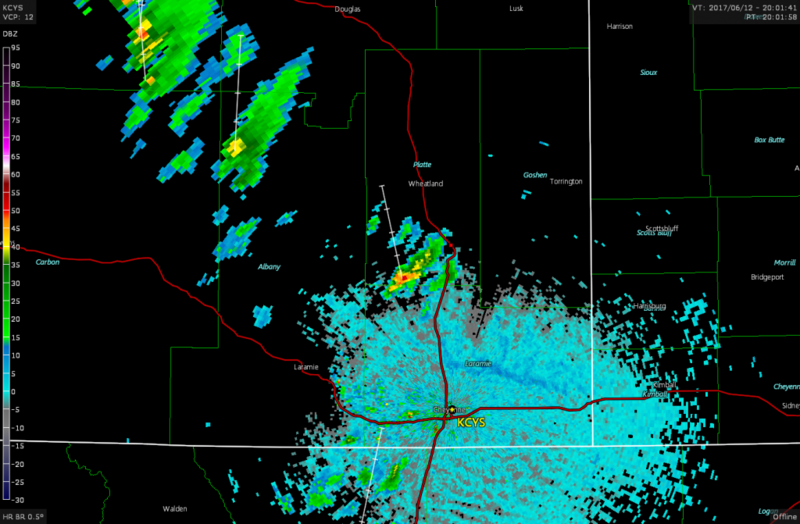 Cheyenne radar showing developing storm at 2014z. Our location marked with red dot. 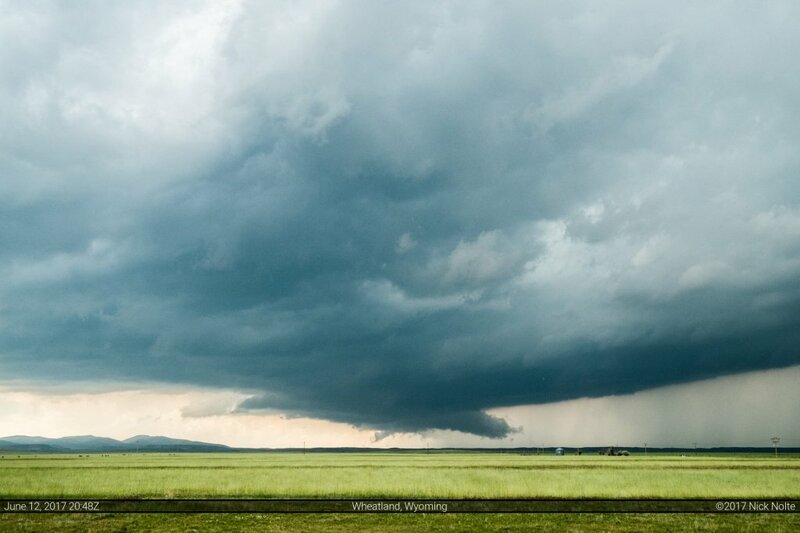 At 2045z the storm began to organize with a clear wall cloud as it drifted north at about 15 knots. 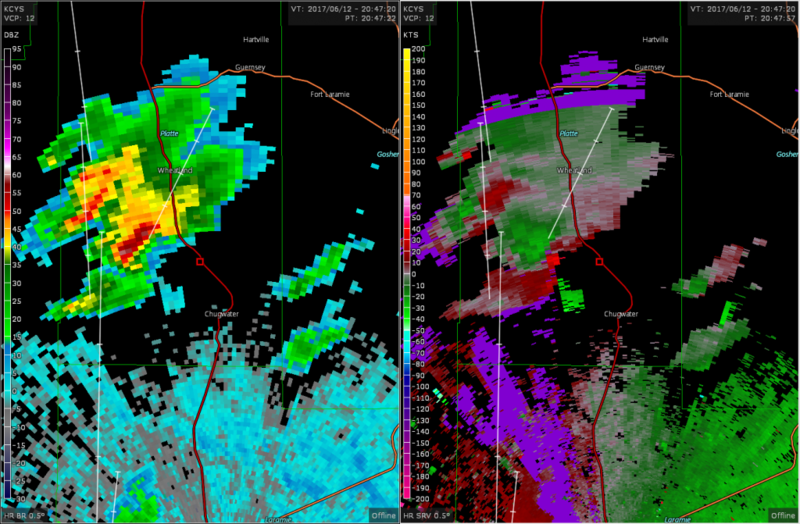 Cheynne radar (left) and storm relative velocity (right) showing a hook with associated mesocyclone. Our location marked with red box. We headed east through Slater then north on a county road east of town to follow the storm as it moved off to the north north-east. The storm cycled several times and at a couple points looked like a tornado was imminent. 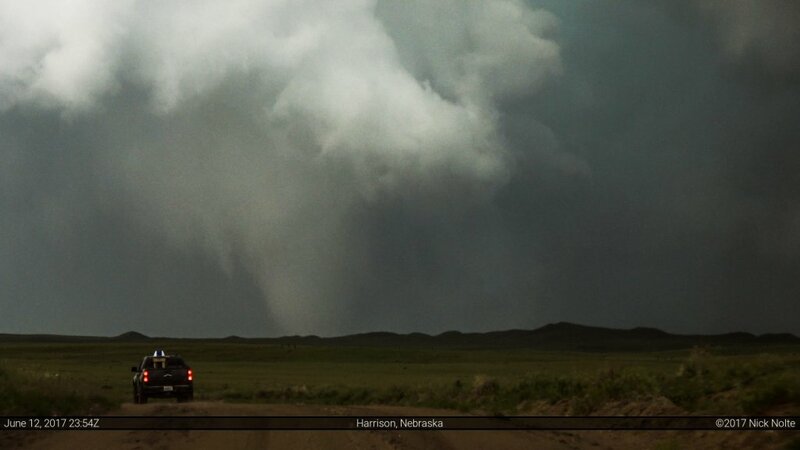 Alas, we followed it for what seemed like seven cycles and it did not drop a tornado. As we approached US 26 east of Fort Laramie, off to the west the storm started to look really interesting. from where we were this looked really suspicious, but as it emerged over the hills it became clear it was just a skinny wall cloud. It had a lot of people fooled as reports of funnel clouds came in and people were lined up along the roads filming. We continued on and eventually we came to Lingle, Wyoming and took US 85 north of town for about 6 miles before stopping to watch the storm recede into the distance and trying to decide whether or not to try to keep up with this storm or blast south to the new development despite the current tornado warning on our storm. While we were deciding what to do, in the distance it appeared our storm finally put down a tornado? 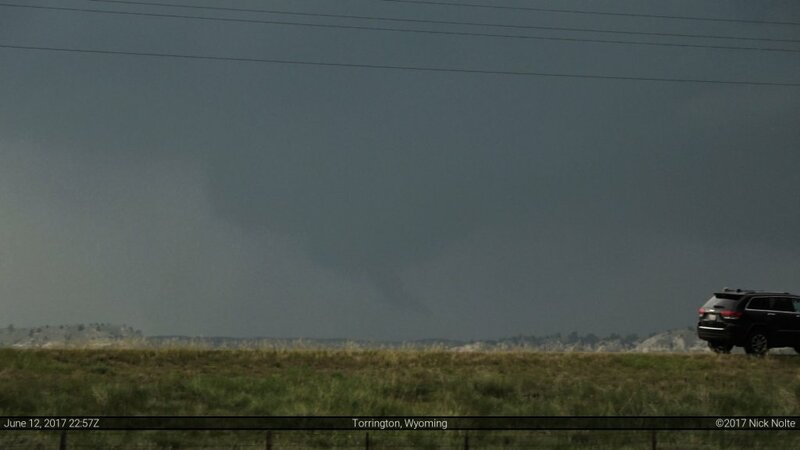 We later confirmed this was indeed a tornado. This kind of made us decide to stick with this storm as we worried blasting south could cause us to miss anything this storm was going to do, plus there’s always that chance you might reach the other storms too late. Now the trick was, how do we keep up with this thing as we entered the sparse road network? We drove east off US 85 on a gravel road that looked like it went pretty far east. We tried to drive north to get a closer look at the storm but ran into the hail and decided to double back and not risk getting stuck. On radar a new cell exploded in front of the cell we were chasing but we could not see beneath it because of a ridge to our north. We continued east on the gravel road eventually crossing into Nebraska and coming to a T-intersection with Henry Road. We turned north, as that was really the only option, and realized this could get interesting as we crossed a cattle guard and it turned into open rangeland. We had to stop for cows a couple times, but other than that we were able to trail the storm pretty well. 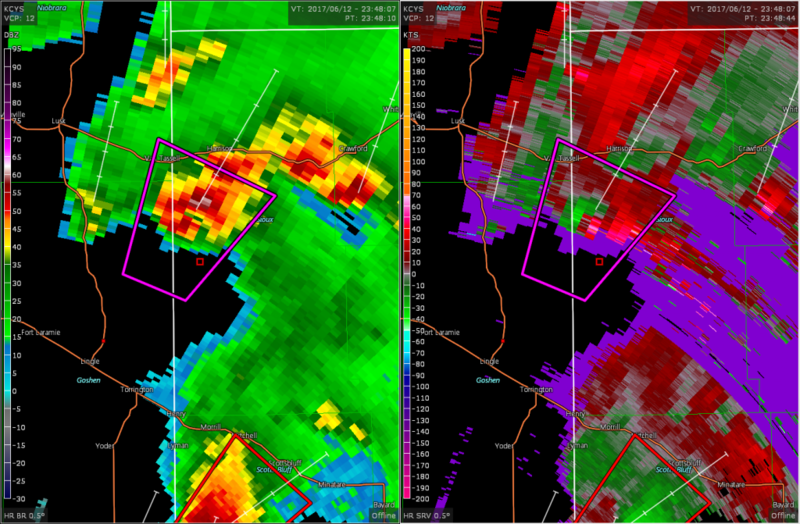 The storm continued to be tornado warned and there was clear hook and rotation indicated on radar. 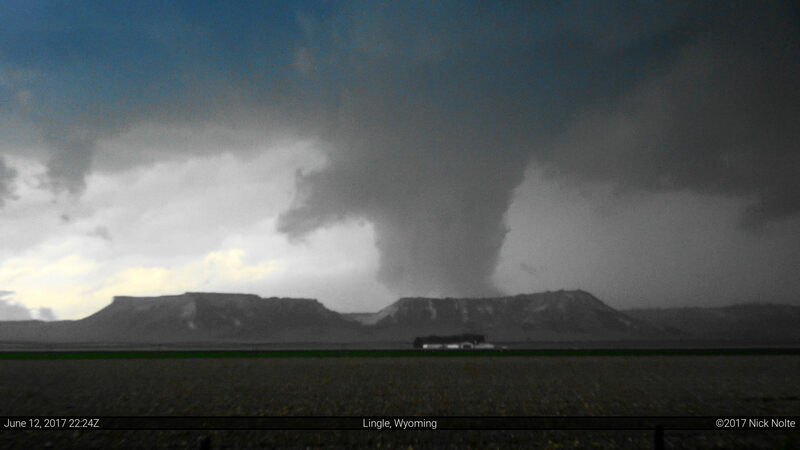 Eventually we rounded a corner and a large stovepipe tornado revealed itself to the north. We continued to track along with it as it stayed on the ground for quite a while eventually dissipating several miles south of US 20 near the river southwest of Harrison. Turned out that this EF-2 tornado was on the ground for nearly an hour across 25 miles, however for the first half of its path we were unable to see it due to ridges to our northwest blocking out view of the lower portions of the storm. All in all, another successful chase day and we headed to Chadron for the night.